At a time in our lives when bullying is so prevalent and not tolerated and inclusion is the word of the day, it seems Palacio’s novel and the subsequent film ring true. Wonder is a feel-good movie with a deeper message that stars a great cast. We have all heard the saying "kids can be cruel". This is especially true for middle school-aged children. They make fun of any little difference anyone displays and bully each other relentlessly. So imagine being a nine-year-old boy with facial deformities who was previously homeschooled stepping out into the world of middle school surrounded by other kids who would stare and call him names and alienate him. Such is the basis of R.J. Palacio's young adult novel called Wonder. 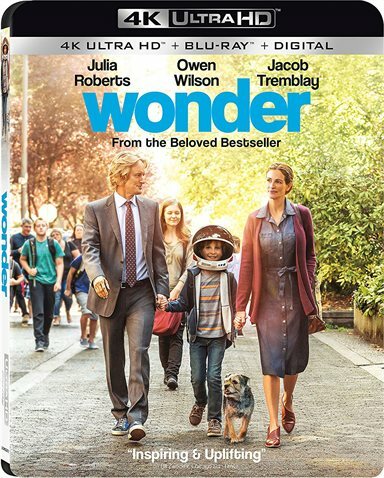 Wonder, as with so many other successful novels, has been made into a major motion picture that is coming to Blu-ray, DVD and Digital HD this week. August "Auggie" Pullman (Jacob Trembly; Room) dreams of being an astronaut for many reasons. Among them is that he would probably never have to take off his helmet and reveal his scarred face to anyone. Auggie was born with facial deformities and has had 23 surgeries to not only help his quality of life but to try and make him look somewhat "normal". For obvious reasons, he is a shy and quiet kid who has been taught by his mother, Isabel (Julia Roberts, Pretty Woman) up until this point. As he is about to start middle school, the decision is made to send him to a real school with other kids. That goes about as well as one would expect. Other kids shun him, pick on him, and claim he has the plague. Over time, however, some of the kids get to know Auggie, he makes friends and ends up defeating the bully who has harassed him all year; however, not without a few stumbling blocks along the way. We also see the dynamics between Auggie and his sister, Via (Izabela Vidovic; The Fosters) who has always lived in the shadows of her younger sibling with the medical issues. Plus, we see how Mom and Dad, Nate (Owen Wilson; Wedding Crashers), deal with the challenges they all face as Auggie ventures out into the world. Trembly has already established himself as a talented, young actor and this role is just further proof of his abilities. Roberts is as excellent in the role of Auggie's mother as she is in most parts and Wilson blends well with the other two to make up a cohesive family. Vidovic, though, is a stand out in her role as the protective, yet virtually ignored, older sister. She handles a range of emotions beautifully and takes the audience on a journey with her. The film also has a number of terrific young actors in the supporting roles and Mandy Patinkin (Homeland) as the school principal is also well cast. The 4K Blu-ray is presented in 2160p high definition video with an aspect ratio of 2.40:1. The details on Auggie's face can be seen clearly making one marvel at the makeup artists talents and the colors throughout the film are vibrant and alive. The Dolby TrueHD 7.1 audio is also magnificent with a blend of dialogue and truly enjoyable soundtrack subtly playing in the background. The Combo pack offers the 4K Blu-ray, the regular Blu-ray, and a Digital HD copy of the film. The regular disc houses all the extras including Audio Commentary with Stephen Chbosky and R.J. Palacio and the Summer of Fun Multi-Part Documentary with five featurettes covering topics such as casting, and the makeup effects. Also included are A Child's Sense of Wonder, What a Wonderful World, "Brand New Eyes" Music Video, Theatrical Trailers and Wonder Soundtrack Behind the Scenes. All are informative and interesting. At a time in our lives when bullying is so prevalent and not tolerated, and inclusion is the word of the day, it seems Palacio's novel, and the subsequent film, ring true. Wonder is a feel-good movie with a deeper message that stars a great cast. I recommend watching it with the whole family. Download Wonder from the iTunes Store in Digial HD. For more information about Wonder visit the FlickDirect Movie Database.